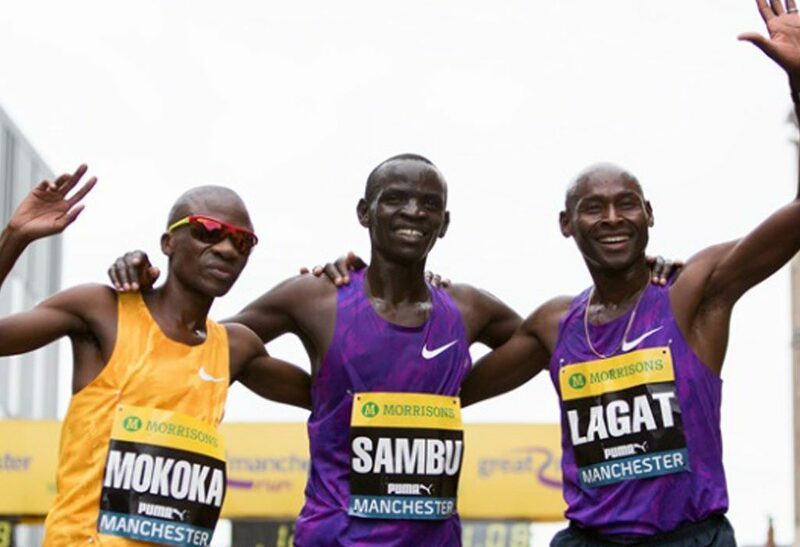 Kenya's Stephen Sambu claimed top spot in the 2015 world rankings as he emerged victorious from the Morrisons Great Manchester Run, towing training partner Bernard Lagat to a new Masters Over 40 world record for 10km. Sambu also had the satisfaction of completing a Kenyan double in Europe's biggest 10km running event, compatriot Betsy Saina having already secured victory in the elite women's race ahead of Britain's Gemma Steel before the 26-year-old University of Arizona graduate took the men's title in 27 minutes 30 seconds. Stephen Sambu's time was the fastest 10km on the road in the world this year, 17 seconds quicker than fellow Kenyan Japhet Korir recorded for the distance in Wurzburg, Germany, last month. 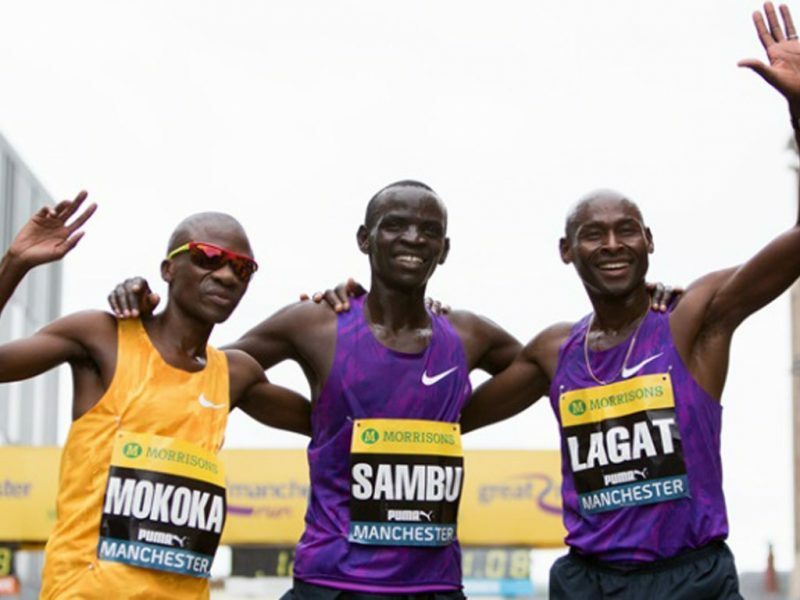 It was the fastest winning time in the Morrisons Great Manchester Run for eight years and the third quickest ever in the prestigious IAAF Gold Label event – behind Micah Kogo's 2007 course record of 27 minutes 21 seconds, and the 27 minutes 25 seconds recorded by Haile Gebrselassie in 2005. Sambu, a sub-27 minutes 10,000m runner on the track last summer, was one of six men who formed a lead pack in the early stages. At halfway, which he reached in 13 minutes 51 seconds, he and South Africa's Stephen Mokoka were pulling clear of Kenya's Olympic marathon bronze medallist Wilson Kipsang and Lagat, the former world 1500m and 5,000m champion, with whom Sambu trains in Tuscon, Arizona. Stephen Mokoka, the World Student Games 10,000m champion, hung on for as long as he could but with a mile to go his challenge started to fade. Still, Mokoka managed to keep the gap to eight seconds and was rewarded with a South African 10km record of 27 minutes 38 seconds – an improvement of 22 seconds on the near-historic national mark set way back in 1980 by Matthews Motshowareta. Lagat, the Kenyan-born American who rewrote the Masters world record book during the indoor season, was overjoyed to cross the line third in 27 minutes 48 seconds – an outstanding time on the track specialist's 10km road debut and 12 seconds inside the Over 40 world best time set in Manchester in 2013 by Gebrselassie. It just so happened that Gebrselassie was also in the race yesterday, the 42-year-old Ethiopian great finishing 16th in the elite men's race in 30 minutes 05 seconds before setting off to complete the course again with one of the waves of the mass field. “It was a tough race but I did the training and Stephen helped me a lot. He turned back to look for me after the first kilometre and encouraged me to move up and join the lead group. Kipsang, former holder of the world record for the marathon, found the effort of his second placed run in the London Marathon just a fortnight ago taking an inevitable toll in the second half of the race yesterday, fading to fourth in 27 minutes 48 seconds. Remarkably, it was Sambu's first race in Europe. “I am happy with my run,” he said. “And I am happy that Bernard has broken the Masters world record. I told him not to worry about the pace. Betsy Saina, the 2012 African Championship 10,000m bronze medallist, and fellow Kenyan Caroline Kilel forged ahead in the early stages but after reaching halfway in 15 minutes 41 seconds the latter started to fade – the effort of her sixth placed run in the Boston Marathon two weeks ago clearly catching up with the Commonwealth marathon silver medallist. Steel, who was second to Olympic 10,000m champion Tirunesh Dibaba in last year's race, came through strongly in the second half, dropping world marathon champion Edna Kiplagat and passing the fading Kilel. Saina finished a clear winner in 31 minutes 49 seconds, with Steel runner-up in 31 minutes 55 seconds, Kiplagat third in 31 minutes 57 seconds and Kilel fourth in 32 minutes 18 seconds. “I just wanted to win my race so bad after racing on the track last weekend [finishing second over 5,000m in the Payton Jordan Invitational meeting at Stanford University in California] and making a last minute decision to run here,” said Saina, who studied in the United States and is based in Colorado Springs.